Each year a mixed flock of Gray-crowned and Black Rosy-finches winters in seasonally abandoned Cliff Swallow nests across the highway from Discovery Park just below Lucky Peak Dam near Boise. eBird frequency chart for Rosy-Finches in Ada County. We had a few failed attempts to find the rosy-finches early in January and February, but luckily received some good advice from a few other birders that helped us track down the birds. There isn't really any good viewing location that's close to the birds, so they can only be seen well through a scope. If you don't know the right location on the cliff side it can be very difficult to spot them. 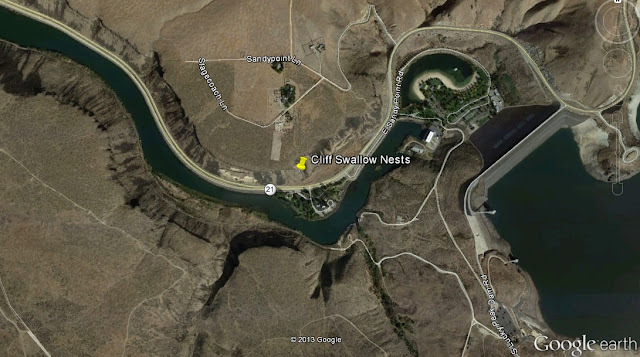 Location of Cliff Swallow nests at Discovery Park, Ada County. 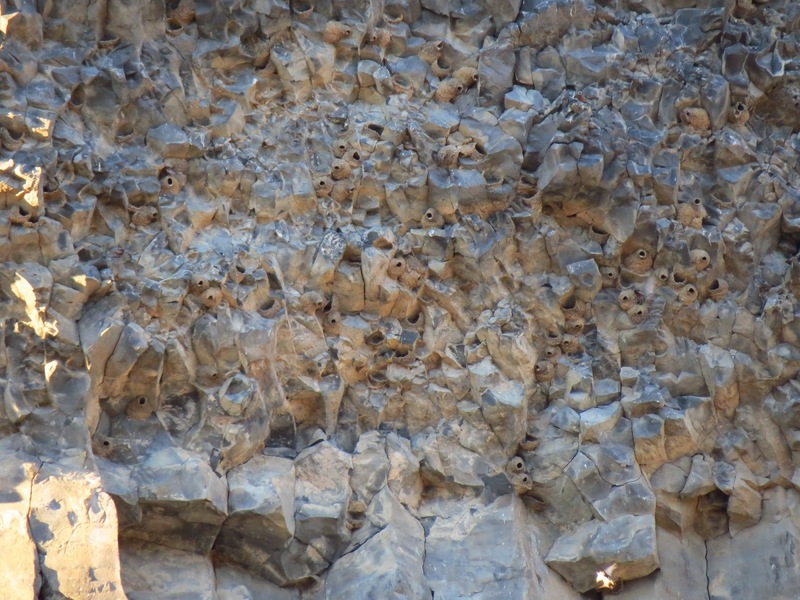 The Cliff Swallow nests are well camouflaged against the cliff side, but once you spot them it's not hard to keep an eye out for the rosy-finches coming and going. Cliff Swallow nests on the cliff side. Discovery Park, Ada County. February 10, 2013. We took a bit of video with our camera to give a better impression of how many rosy-finches there were. Every now and again most of the flock would take flight all at once and circle around a time or two before landing again. Since we can't all bird full-time! Dedicated to part-time birders with a full-time obsession. Focusing primarily on birds of the intermountain west, plus anything else accessible from the occasional vacation. Don't just bird ... eBird! Bird Book of the Year? What are the problem IDs?